Year 1980, 1981, 1982, 1983, 1084, 1985, 1986, 1987, 1988, 1989, 1990, 1991, 1992, 1993, 1994, 1995, 1996. ECU engine management computer to control injection, ignition and control stationairloop for Fiat Panda with 1000 cc gasoline engine. The unit is work..
Used copy of the original workshop manual for Fiat Panda 30 and 45. The book is in good condition except for a single dog ear and speck. 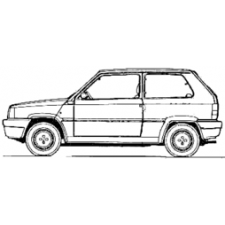 All pages are..
Used workshop manual for maintenance to Fiat Panda (the first model). Published by Leonard Lang training center persons.The book is in good condition,..